to the Peary 1909 North Pole Miracle? For the last few years, certain fanatical advocates for lately co-debunked North Pole “co-discoverer” Matthew Henson have found it cathartic to combine fiscal and propaganda forces with the Peary-Grosvenor contingent &co to trick Google into high-ranking its attack-animal sites' revenge against DR and others for their parts in ending professional acceptance of the Peary-Henson N.Pole myth — which is now dead as far as neutral polar professionals are concerned. Other than pointing readers to the sites themselves (to give onlookers an idea of how low the former-orthodoxy Peary forces have fallen — and stooped), DR has for years not reacted. He trusts that what follows will assist neutral historians in arriving at a non-hype-blinded appraisal of what Matthew Henson did and did not contribute to Peary's amazing career and to — in the cause of justice — start considering the merits of other previously-neglected assistants to famous explorers. It is worth adding here that the massiveness and rage of the attacks on those who dissent regarding Henson's glorification suggest an intent to intimidate non-worshipping historians into silence. All the more reason for the present posting. When DR wrote his 1973 book on Peary's 1909 North Pole hoax (Rawlins Peary at the North Pole, Fact or Fiction? ), he treated Peary's assistant Matthew Henson in an admiring and sympathetic way (see also DR's reaction to the Peary family's charges against Henson, at DIO 1.1  ‡4 §D4 [pp.25-26]) — including emphasis on Peary's and Henson's genuine and unexceedable 1900/5/13 discovery of the northernmost point of land on Earth, Cape Jesup. Given Henson's initial life-disadvantages, such an achievement is worth a glorifying website in itself. And though it is true (as has been noted) that Henson was not really an explorer without Peary, it should conversely be kept in mind that Peary was less of an explorer without Henson. (Peary's two pseudo-discoveries of Jesup Land [1899/7/18] and Crocker Land [1906/6/24&28] were his only arctic explorations when he left Henson back at camp. Both were fakes. Which doesn't say much for Peary's greatness in Henson's absence.) Peary himself is said to have stated of Henson (though this was probably part of his alibi for not having a more acceptable witness to his 1909 claim): “I can't get along without him.” But, facing facts: of the two men, whose talents were the rarer and least readily replaceable? During DR's years of researches into Peary's claims, he increasingly became aware that Henson's qualities had become deliberately exaggerated by those establishmentarians (Donald MacMillan, Bill Stephenson, and Terris Moore) who tried fending off doubts of Peary's 1909 N.Pole miracle by pretending that Henson's witness was a qualified certification of it. Among other Peary assistants, Henson occasionally broke the trail (i.e., took the lead) during Peary's 1906 and 1909 sledge-drives at the North Pole. So it is worth knowing whether he was a person of good judgement, was skilled at navigation, etc — and what qualifications he possessed, relative to being an expedition leader in a serious sense of the term. Among other items on the plus side, Henson was Peary's main sledge-repairer, a vital skill. And his ability with the Eskimo tongue was said to be better than that of most or all of Peary's men (his phonetic way of writing may suggest a sensitive listener). And, though none of them spoke fluent Eskimo, regardless, Henson was one of those who in 1909 cross-questioned Cook's two 1908 “North Pole” Eskimos, resulting in a map of Cook's actual 1908 journey (Rawlins Peary Fiction  p.94), the accuracy of which is certified by its correct location of previously unknown Meighen Island. Henson also elicited, from the two Eskimos who were with Peary when he left Camp Jesup to make his 1st “North Pole” sextant observations, that they “witnessed the disappointment of Commander Peary”. (Henson Boston American 1910/7/17; Rawlins Fiction pp.151-152.) This key testimony is due to Henson's verbal skills. After the Peary Papers became available, DR was confronted in the late 1980s with ever more of the truth of Henson's limitations. To put it plainly: among assistants of major polar explorers, Henson does not in some key respects compare well with, e.g., W.Penny's & E.Kane's Johan C.C.Petersen (author), F.Nansen's Otto Sverdrup (author), R.Amundsen's Helmer Hanssen (author), Sverre Hassel, & Oskar Wisting (author), R.Byrd's and L.Ellsworth's Bernt Balchen (author) — all fully literate men, motivated travellers, and (like their famous bosses) skilled at navigation — including the specialized mathematics of navigation. Henson was — like partly American-Indian (and fellow Marylander) DR — probably of mixed heritage. (It is even possible that he was slightly more white than black, genetically. Though, who but a sample-of-1-extrapolator and-or a divisive propagandist for race-“pride” could care, one way or the other?) But had Henson not been classified as “black” (by the one-drop-rule so dear to antique slavers and modern demagogues) he would be largely forgotten today. Which would be cruelly unjust for one who suffered almost as much as Peary physically (and a great deal more, psychologically) — for trivial financial gain and far less glory in his lifetime. Henson, along with other polar explorers previously cited here fully merit historians' remembrance. However, balance has thus far been lacking — in that Henson has had far more coverage than the others, most of it lately ranging from hagiographic to mythic. To somewhat right the balance of historical information on Henson, this page will (at least for now) post merely three items:  a fact,  a small nest of references, and  a document. Try plumbing the Henson Collection at Morgan State University (Special Collections, Soper Library), Baltimore. Though his 1909 camera is there, as well as typed notes (apparently for his public lectures, indicating that he could read swiftly enough for their utility), DR's 1991/6/4 visit learned that not a single diary or letter (or notes on navigation) by Henson exists in the collection. (One doubts this reality will be much advertised on certain websites — unless a paranoid interpretation can be spun on or from it.) In other words, it looks like a great deal of mythology has been generated from very little solid material. Questions about Henson's biography & skills are considered with balance, sympathy, and thoroughness in Robert M. Bryce's Cook & Peary, the Polar Controversy Resolved (Stackpole, Mechanicsburg, 1997) pp.996, 1002, 1077 (which quotes the conclusion of the Henson 1906/9/5 letter posted here), 1078, 1097. See also DIO 2.2  n.43 [p.65] on Univ-Alaska-Prez Terris Moore's NGS-catering fantasy that Henson knew all about Greenwich Mean Time, Greenwich Hour Angle, and the Equation of Time: DIO 7.1 . Should we finally be blunt and straight-out ask: does there exist any evidence that Henson could even spell Greenwich Mean Time, much less compute with it? I have heard in the Last few days that there have been a Good many tales have been told to you about me and what I have said about the Eskimos. I heard that Marving [Prof. Ross Marvin] & the captain [Bob Bartlett] told you this Spring before we went on [onto] the [Arctic Ocean] ice that, I was Influence the Eskimos not to do as there was told, and when you told them to do something I would tell them to do it some other way. I heard that the captain and Charle [steward Charles Percy] told you, and also when you went around the coast [1906 June-July] that Charle told you that I was kicking about the food which was falce. one eveing when I was coming though the Galley Jack the watchman ask me if I would have a cup of tea and I said yeas. But there was no Bread Jack said yeas there was Bread on the table Charle sing out dont tuch that Bread Because [“he” written-in above line] wanted it for toast saying that he would Give me a Pice which he did. When he handed it to me saying that youall was more truble to him than there was worth I said it was to Bad about you and he made the Remark that youall eat to darn much and that started the Row. But nothing elce was said about the food he curst me and I curst him and told him if he did not Like it he meed not take it then he went to you with his tail of waugh, thinking there was no other way of Geting eaving with me except Lying. I had heard that he had mad his Brags, Before we came off the [ice] that he would get eaving with me Because his Boy did not Go won the ice. [a] The quality of the letter's handwriting suggests Henson was exposed to somewhat more education (or took to the penmanship part of it quicker) than his biographers have realized. 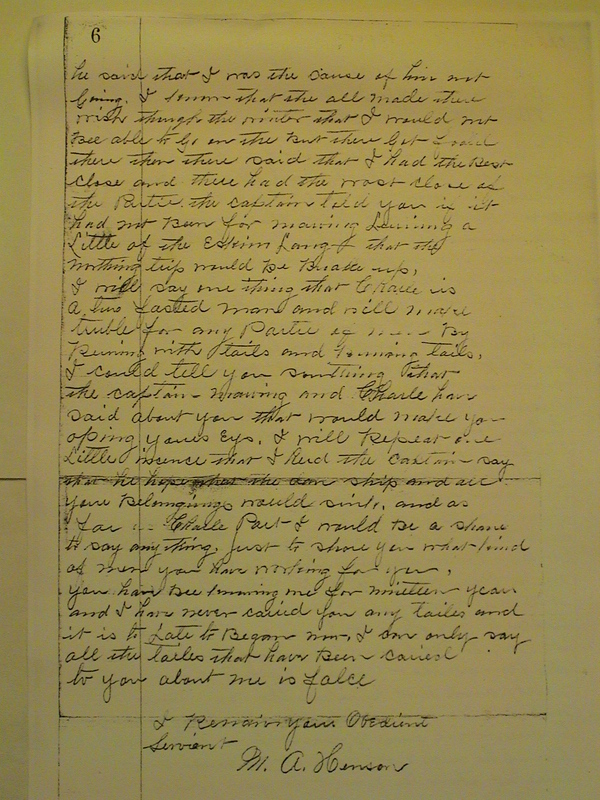 [b] His spellings of the names of Marvin and of Charlie indicate that he either never read the documents connected with the expedition, or did not absorb them. 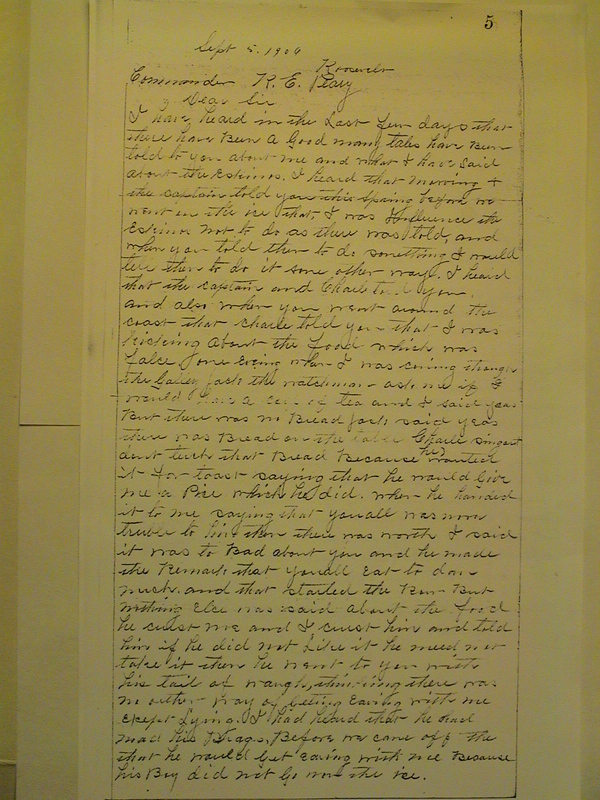 [c] His inserted corrections suggest that he reviewed the letter and regarded its present state as satisfactory. [d] The inconsistent spelling of “tale” (among other symptoms) suggests a semi-phonetic literacy level. [e] Whatever statistical correlations might apply for that time, the handicap of partial literacy was not restricted to any ethnic group. Several assistants on this and other expeditions were not fully literate. But, then, no one is trying to elevate them to the status which current heresy-loathing flame-keeper propaganda-sites seek for Henson. [f] Except for a few signatures (R.Bryce 1997 p.1077) of inconsistent spelling but with the same handwriting, this lone letter appears to constitute the entire authentic literary legacy of Matthew Henson. [g] Forgetting the matter of literacy and concentrating instead upon the letter's narrative and its net contribution to the vision and sometime greatness of Peary's amazing career of exploration: does this document resonate with the qualities of a grand figure of history? [h] Finally, what is the suggested value of Henson as a witness to the geographical and navigational aspects of a famous 1909 scientific claim?